Last Friday I went to a used book sale in our area. It is held every other month and it is to benefit a charity that helps families in need with food and medical help. I enjoy going to this sale. Sometimes I only find a book or two, other times I come away with quite a stack of books to read. They have everything from kids books, old books, cookbooks, and more. This time I found some really good deals. This book was only $1. The cover price on it is $40. Would I ever have paid $40? NO! But for $1 I though it was worth getting. I love looking through cookbooks like this. It gives me ideas, and I always learn a few tips. I will admit though most of Julia Child’s recipes are not my style, at least I did not think they were. When I think of Julia Child, I think of fancy, gourmet meals that take hours to prepare. As I have been looking through this cookbook, I have been very surprised at some of the recipes in it. They are quite plain and simple. Yes, 3/4 of the recipes are for things I would never cook. I won’t be roasting a duck anytime soon or making Seafood Bread. But, what I discovered mixed in with these gourmet recipes were some very simple and basic ones, like Julia’s Old Fashioned Hash-Browns. There was a basic chicken pot pie and a roast recipe. Julia had a recipe for frying hamburgers. Jacque had a recipe for Ragout of White Beans, which sounds quite gourmet but is really only a simple slow cooked bean recipe. There are recipes for simple vegetable dishes like green beans, peas, and cabbage. After spending time reading this book, I began to realize that even Julia Child and Jacques Pepin realize that most people will be cooking simple recipes with simple ingredients. Yes, they use the freshest of ingredients, the best they can find. But, they are still simple and basic. If Julia Child can serve simple things like hash browns or chicken pot pie, why do I feel the need to make fancy dinners? We can make simple basic things that taste good but do not have to break our budget. What this book has reminded me is that you do not have to spend a lot of money on expensive ingredients for recipes. If you take simple ingredients and take the time to learn the best way of cooking them, you will have gourmet results. Instead of trying to make potatoes, meats, or vegetables more gourmet by adding all kinds of extra ingredients just learn how to cook them the best way. If you like gourmet cooking but can’t afford all kinds of ingredients try focusing on the techniques of gourmet cooking instead of all the “stuff” they use. I think if we step back and focus on that, we will realize that gourmet cooking is not just about fancy, expensive ingredients. It is also about learning to prepare food in a way to best bring out it’s own flavors. So, yes I do think you can be frugal and be gourmet. 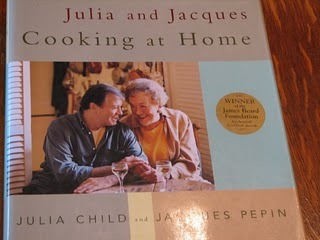 I got a Julia Child cookbook from the library last year – that first one she wrote with her French friends. (I was a French major, so it endeared me.) Anyway, I found the basic techniques to be VERY helpful. It’s true I won’t be making some of the funkier recipes, but the basics were really helpful — and come to find out, that was her purpose– to teach the basics. My hubby is a picky eater and meat & pot. kind of guy. So bringing out the flavors is important to me. I’ll have to look in to this more. I love the library. I have heard that you don’t have to cook fancy for company–if you give someone the best meatloaf or mac & cheese they ever had, that’s ‘gourmet’ enough! By the way, did you know that Julia was in her mid-30s before she took up cooking? As a child, her meals had been cooked by a maid! Her husband liked to eat good food, so she made it a point to learn how to cook for him! Mom2fur, you must have watched Julia Child’s bio on food network. If not, I did and they talked about that. I was amazed. I never realized that she did not have much formal training. I don’t watch much tv but I saw that bio of Julia and knew I would like it. And I did.